It is the beginning of another school year. It looks a little different this year as this time, we have two in high school and the younger two are 5th and 7th grade. Barring any arguments about what or how school will be done, we should conquer all and learn this year once again. We are using My Father’s World- Exploring Cultures and Countries, Ancient History and Literature as well as US history. This will be our 6th year using My Father’s World. I am working hard to keep things very simple and focusing on learning, but yet, not stress about it to an extreme. It seems there has to be a good balance between overloading students and lacking discipline. 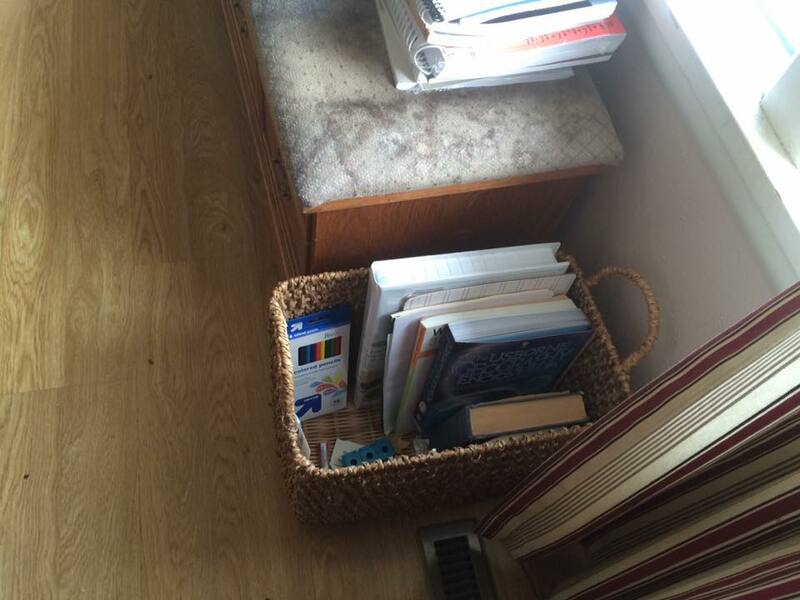 Grade 12 books that do not have a home yet and are still sitting in the living room on the bench. 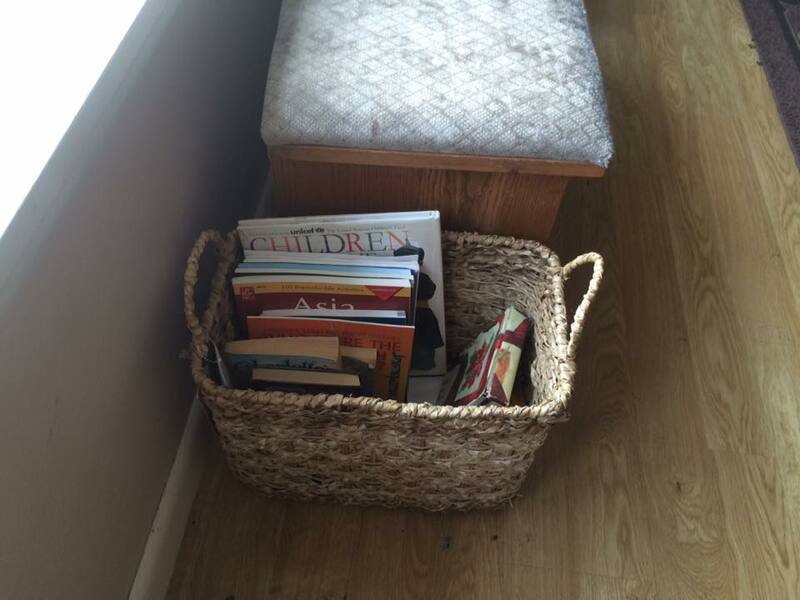 Grade 9 Book Basket – Ben Hur is one of the extra reads we are going to try for as well. 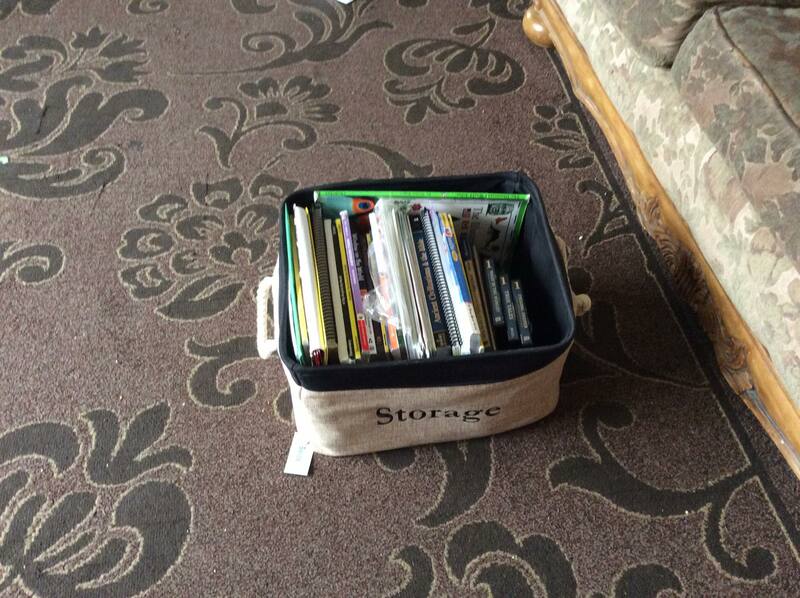 I also bought an Usborne Encyclopedia as I am going to work on some the ECC geography with my 9th grader as well. 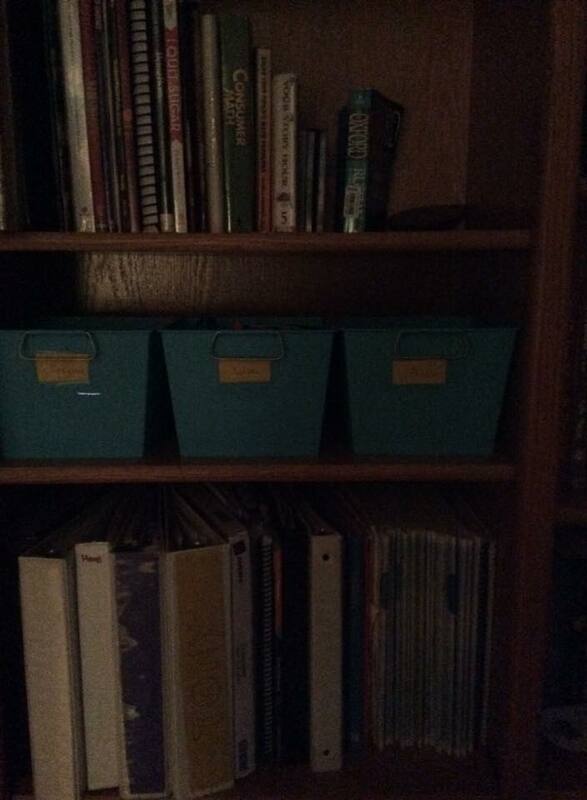 My organized shelf in my room with binders, extra books we are not using, pencils, glue, crayons, scissors etc. 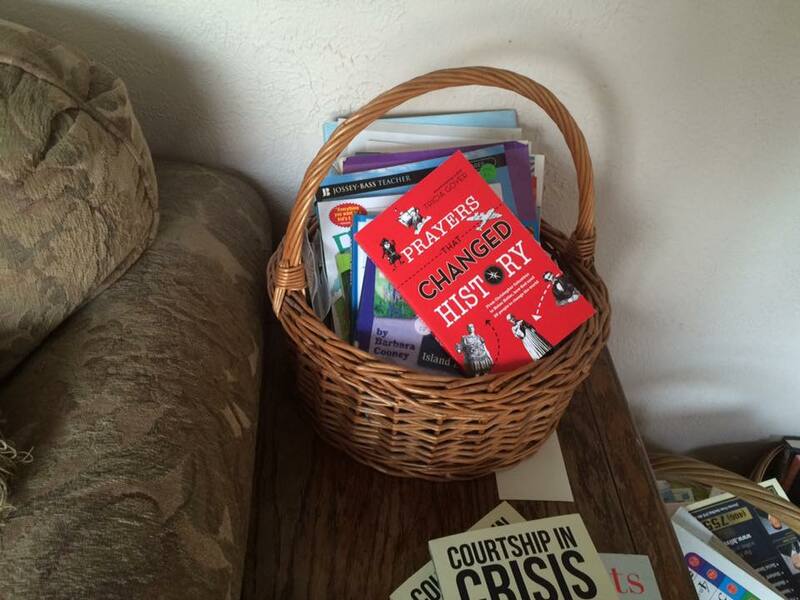 My main basket… stored in the living room. I feel very unprepared this year, but am going slowly, but surely forward! This book has a beautiful cover and an alternative writing style that will appeal to many teens that do not read a ton. The chopped clipped sentences were unusual for me. I enjoy a more in depth literature with well thought out vocabulary normally, but also love young adult reads on harder topics. This book is written in more a journal type style, with slang and not a lot of detail. It works hard to address some topics that many teen girls may face, abuse, weight, bullying, rejection and issues with parents. The book, like others from this publisher, only takes place over a week. I felt as if I knew the girls about as well as I would know a new neighbor that I have known for a week. I was mildly interested, felt sorry for them, but was not invested enough to care too much what happened. I think the author did a good job with writing a book to engage readers that struggle with deeper books, but still need to read about hard topics. She failed in engaging readers in any kind of redeeming quality. There was even some unhealthy behavior that was not addressed at all by any of the adults. The reader would be left wondering what was the right thing. Depression, angst and humiliation is throughout the story without many redeeming qualities. However, this book, for the intended audience will likely cause some young women to think. It would be one that you could hand a non-Christian friend, as there is no mention of anything Christian in this book. When you are a homeschooler, you end up realizing pretty quickly that school ends up being a way of life. One thing that I found was that you can find some great resources to help you teach practical skills, while getting your errands done with a little planning. Grocery Cart Math is a great resource that can be good for 3rd-6th graders to not only keep the kids busy in the grocery store, but also fulfill an extra math assignment. You can write in the book, but also, I believe this one is reproducible in your own family. Make sure to check the copyrights in the front though. There are many other links to ideas to help incorporate real life skills into our children. Math often sometimes seems hard to use for children in the classroom or at the kitchen table. For boys, especially, that love to eat, making it a practical application can really help excite them. They can see the reality of how it is useful! Check out a few of these other links for ideas you can use. Some of them were made for classrooms, so change and make them work for you. All in all, keep it simple. If you don’t have time before the grocery store run, do something simple. Hand your child a calculator. Everything you put in the cart, have them keep track of it. As you shop, ask for the running total. If you have coupons, let them keep track of them and show them how to figure if it is really saving you money. As they get older, involve them in meal planning, shopping, cooking and figuring out how to stick to a budget. Often we teach our high schoolers Algebra, Geometry, Biology, and Chemistry and they leave home and go into debt over groceries. Those subjects are important, but start with the small stuff when they are young too. I have throughly enjoyed all of Sarah Sundin’s books, I mean, what is not to like? 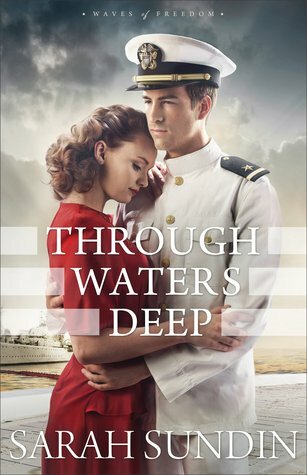 Beautiful covers, flawed characters, World War 2 fiction? All of my favorite things! This one is a little different than her others, which threw me for a loop at first and I realized that I wanted to sit down and concentrate on it. I usually do a fly by reading, which means I read in very short segments. 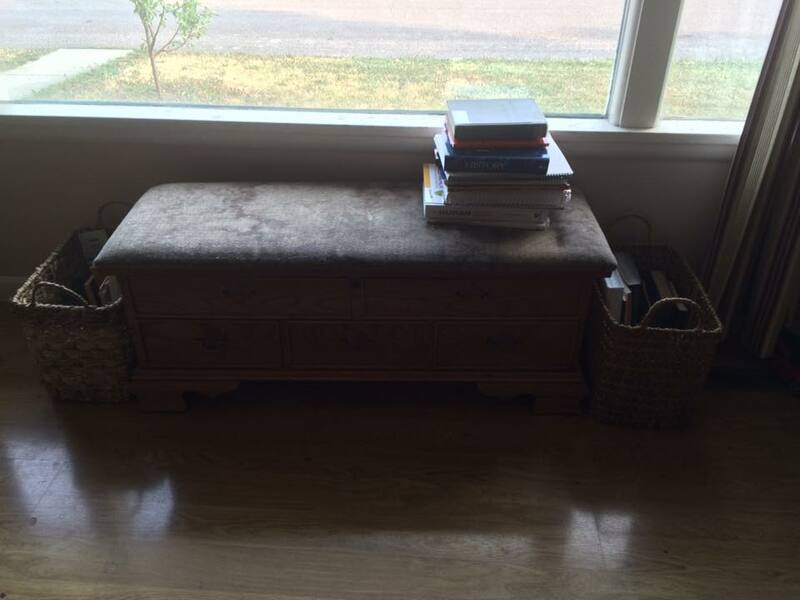 My life has been busy, so it has been more 5 minutes here and 10 minutes there, than anything else for reading. It is not terribly satisfying, but better than nothing. However, for this book, I highly recommend giving it your full attention. It starts out slow, but pulls you in with the subtle mystery surrounding events that take place before WW2. Sarah’s ability to create pretty characters with distinct flaws is no different in this book. I loved seeing the characters grow and change throughout the story. I will also say this, if you love 1940’s fashion, you will adore this book! Check out Sarah’s Pinterest board for pictures, but this book describes the dresses in such good detail, I felt like I could go and buy it at the store and I knew what it looked like already! While this book surprised me with the more mystery bent of it, I throughly enjoyed it and will look forward to the rest of this series! I already bought a second copy to lend/give away of this one and I suggest you do the same!